The thing I like about Asian sweet breads is that they aren't too sweet. It's almost like eating a donut with less sugar (generally speaking that is). And I like that the fillings tend to be made from beans and such rather than jelly and chocolate. 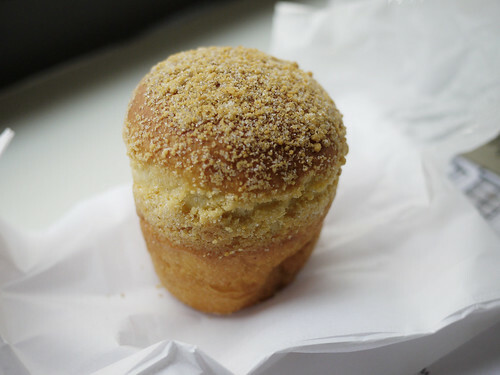 This one from a Korean bakery really hit the spot. The filling was more an almond paste, but for all of you who like almonds but dislike marzipan. It tasted of sweetened ground almonds but not like almond paste where you get that super concentrated flavor that almost tastes fake.